Bloomberg portrayed Apple's Give Back as a desperate handout. It isn't. Apple resells models as refurbished. Writing for Bloomberg, Mark Gurman cited an unnamed "person familiar with the situation" as provocatively portraying the work of Apple's marketing team to sell more iPhones as being a "fire drill" and "a possible admission" that new iPhones "may have been selling below some expectations." As Roger Fingas reported on Tuesday, AppleInsider spoke with sources actually inside Apple, who stated that the moves were in no way a "fire drill" as described by Bloomberg but rather a "normal seasonal response to expected consumer trends," although they said they were not authorized to speak on behalf of the company. Gurman seemed particularly shocked to find Apple "adding a new banner to the top of its website advertising the iPhone XR for $449, $300 less than its official sticker price," a subject he also tweeted about as if the trade-in program -- or marketing in general -- was new and unprecedented. For Bloomberg, Gurman more conservatively characterized the offer as being "discount promotions via generous device buyback terms," although Apple's "limited time" trade-in offer of $300 for an iPhone 7 Plus in good condition is only $50 more than the typical credit it offers, and likely less than a private buyer might offer. It's also significantly less than Apple currently sells an iPhone 7 Plus for in its refurbished online offerings, where 128GB models -- the only ones currently available -- are listed as regularly costing $669, with a temporary sale price of $569 right now. Apple's trade-in and refurbished sales are not money-losing efforts desperately trying to subsidize new phone sales. They exist to help people to buy the newest model and to find second-hand buyers looking for an affordable iPhone. This year, Apple changed the name of its used device trade-in program to "Give Back," but it is not a new program, nor was it hastily released after discovering that new iPhones weren't selling. It's actually an expanded effort by Apple to get in on the second-hand business related to buying used devices. Because its products are durable and support software upgrades for years, their long usable lifespan makes used iOS devices more valuable than comparable Androids. The higher third-party resale value of Apple's products enables users to confidently buy higher-end models with the assurance that they will be able to resell the device in the future, retaining significant residual value that can be applied to buying the newest one. Apple's entry into the third-party resale market also gives it a supply of devices it can refurbish and sell in developing countries where a sizable portion of the market lacks the ability to pay for brand new Apple products. In March, Counterpoint Research Director Tom Kang stated, "with 13 percent growth, refurbished smartphones are now close to 10 percent of the total global smartphone market," and added, "the mid low-end market for new smartphones is being cannibalized by refurbished high-end phones, mostly Apple iPhones." In dramatic contrast, Google relentlessly advertised its Pixel 2 phone online last year, offering buyers $300 off with "no trade-in required," if only they would please take delivery of the device the search giant invested incredible amounts of money into developing, advertising and promoting as the highest rated cameraphone. 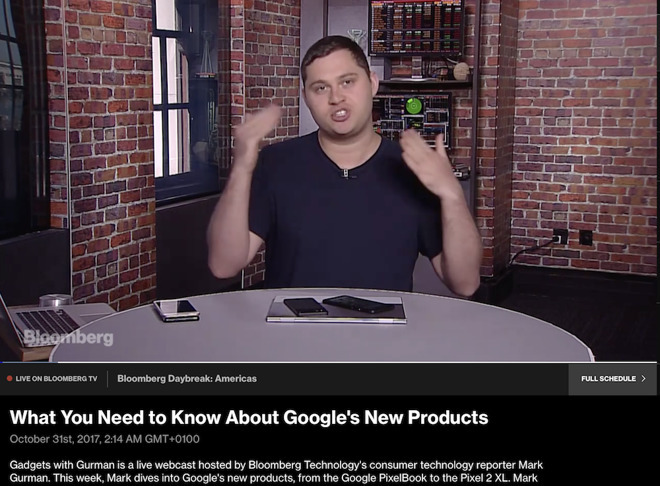 But rather than presenting Google's fire sale as an obvious sign of weak demand for Pixel, Bloomberg provided disproportionate, informercial-like coverage of Google's Pixel products without any concern for how well they were selling. Despite Google's advertising and price slashing, plus highly favorable coverage from Bloomberg very few Pixel phones sold. That demonstrated the extremely minor impact of Google's incessant brand advertising, its huge loss leader rebate offers, and even the fawning media adoration provided by supporters who portray themselves as independent journalists--factors that also did nothing to rescue Google's tablet inititives. Google's inability to break into the mobile device markets that Apple has successfully navigated over the last decade is also partly due to the difficult headwinds faced by anyone attempting to enter into a crowded, established market --particularly the highly competitive smartphone business that appears to be reaching a global saturation in demand. That included Android's founder Andy Rubin, who left Google with the idea of launching an advanced new phone at Essential. Over the last quarter, even phone giant Samsung's smartphone-driven Mobile IM revenues experienced a 12 percent decline YoY, and its profits fell by more than 32 percent. Barely a mention was given, despite the fact that Samsung has long sold the most handsets every year. Samsung's decline is particularly notable because it represents the majority of mainstream Androids with support for Google services, which are not supported by AOSP Android licensees in China, where unit growth is still occurring. However, despite intense competition among middle and lower-tier Android makers in markets where sales units and average selling prices are both waning, Apple continued to sell slightly more phones in the quarter. It also generated more revenue YoY, thanks to higher average selling prices and new sales of accessory hardware and related Services. While Bloomberg and other media outlets continue to focus on unit sales, the reality is that new smartphone growth is largely over, the same way that tablets peaked around 2015 and conventional PCs plateaued around 2010. In all three markets, Apple continues to capture the majority of the valuable high-end segments, taking virtually all of the available profits. Even more importantly, Apple has uniquely built a massive Services business that its hardware rivals haven't. Bloomberg admitted in its trade-in sensationalism piece that "last year, there were similar concerns about sales of the iPhone X, and the handset ended up selling well," a gross simplification of the regular reports the site itself actually promoted as an ongoing narrative, which didn't just "raise concerns about sales," but confidently insisted that Apple's "$999 starting price was too much for some consumers," while in parallel crafting a false "pile of bad news" with story after story of supply chain rumors that implied Apple might be slashing production due to weak demand. "Apple Inc. earnings this week," Bloomberg wrote unequivocally this spring, "will confirm what most investors have finally accepted: The iPhone X didn't live up to the hype." Days later after being proven entirely wrong, Bloomberg sheepishly published the headline, "Apple earnings show growing immunity to smartphone malaise." Bloomberg also published an alarming but thinly sourced security story that claimed Apple's iCloud servers had been compromised for an extended period of time by hackers using chips surreptitiously installed on the hardware used in its data centers. The report was refuted by Apple, by other companies, buy national security experts, and even by its own named source as a confused mess of writing that took a plausible-sounding concept and confidently presented it as a factual news story, rather than being what it was -- poorly-investigated investigative journalism. Yet Bloomberg has refused to retract or substantiate its allegations, and instead cycled right back into "raising concerns about sales" of the latest iPhones using the same discredited supply chain pseudo-scientific "plausibility raised to the level of reality" that made it look foolish just nine months ago. While Apple's trade-in program isn't new, it is new that the company has greatly accelerated its efforts to upgrade its installed base of users to the new technology it first unveiled last year. Over the decade-long history of iPhone, Apple has typically resold previous generations at an incremental discount alongside an all-new flagship model. Last year, it introduced the all-new design of iPhone X with Face ID, at a new peak entry price of $999 alongside the more conventional iPhone 8 and a discounted iPhone 7 lineup. This year, rather than continuing its pattern of only offering discounted older generations next to its newest iPhone XS lineup, it introduced the $750 iPhone XR as its "one more thing," effectively serving as a value-engineered version of its vision for the future of iPhones at a new, much lower price tier. That pricing and engineering work was done long in advance of knowing exactly what level of demand it would encounter for each model when its new phone lineup went on sale. iPhone XR was priced to move-- and to spread iPhone X's technologies to more users at a new lower price tier 2.5 times greater than the $100 discount it has typically offered on the previous year's iPhone generation. Portraying a $50 bonus holiday trade-in offer-- which can be applied to any new iPhone XS or iPhone XR-- as "a possible admission that the devices may have been selling below some expectations" is remarkably ignorant in view of the fact that Apple already engineered a $250 retail price reduction well in advance of any sales, clearly to accelerate upgrades to modern iPhone models supporting Face ID and the new Home-free gestures introduced with iPhone X last year. Apple's installed base of users, now near 1 billion globally, represent a valuable demographic of buyers who are more likely to pay for software, services, and other new hardware, and they consistently pay a premium for iPhones often without even evaluating the competition. By upgrading more of its vast global base of users to its newest technologies faster, Apple can drive wider adoption of its TrueDepth technology and attract more custom development that takes advantage of front-facing depth imaging and face mapping AR. It's not surprising that Apple is "marketing" and incentivizing sales of the new mass market phone. As much as I dislike some of Gurman's report. But as he state, did Apple do something like this before? Why the discount now, why not in Feb or March? 2nd Hand Phone? Have you check how much the iPhone 6s Plus is worth on eBay? Wow DED is really panicked about Apple. Way too many defensive articles the past week or so. Anyway can he point us to a previous example where Apple did this on their front page? I certainly don’t remember them pushing trade-ins like this last year. And putting a price right on the front page. They clearly want people to see that $449 price. Why would Apple be doing any of this if the XR was meeting their sales expectations? You know it is possible some consumers find these phones too expensive and are holding on to what they have (which are still really good phones). From the evidence of Apple’s web page, Bloomberg’s assertion that this could “possibly” be an indication that the phone isn’t selling as well as “some” expectations is actually quite a bit of soft pedaling. But find offense in it if you must - it’s become our national pastime. Lies left unchallenged become truth these days, it seems daft to complain when people set the record straight and call it defensive. Marketing is what successful companies do to sell products. The original copy actually sucked. It looked like placeholder text that someone forgot to change. Not discriptive at all. And why should they promote their price hook on “their front page”? The goal is always to sell every phone you can make. Considering that 10% of the smartphone market is used Iphones I’d makes sure any iPhone customers the showed up on my page knew the could trade directly to me. Its the reason Apple is successfully making all the profits in the markets the compete in. Most can’t even understand why they do what they do. So you're saying Apple has never before promoted features or the price of its iPhones on its website? How incredibly brave to stake your reputation on that. And as for trade-ins, Apple was promoting that last year when Bloomberg and commenters like you were insisting that there was no possible mechanism that could enable anyone on earth to afford a $999 iPhone X. "It's also significantly less than Apple currently sells an iPhone 7 Plus for in its refurbished online offerings, where 128GB models —the only ones currently available —are listed as regularly costing $669, with a temporary sale price of $569 right now." I hope a refurb 128GB iPhone 7 Plus doesn't retail for $669 because I can buy a brand new sim-free one directly from Apple for the exact same price. The $569 price is very likely not "temporary" but rather shown that way for marketing purposes as a comparison to the full price of a new phone. I’m specifically referring to the front page of apple.com. The first photo is from Apple’s online store. The second one looks like Apple’s trade-in page. 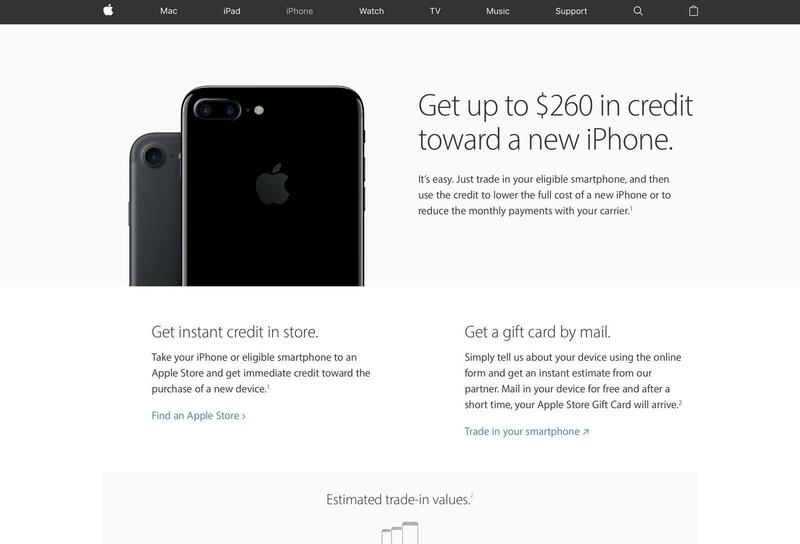 I just looked at a few archived pages of Apple’s website from last December and there were no prices listed or references to trade-ins on the front page. Same thing for 2016 and 2015. This isn’t setting the record straight. The original copy might have sucked but it was very Apple. When they first announced the iPad Pro the marketing copy was Thin. Light. Epic. When the iPhone 7 was announced the copy was This is 7. 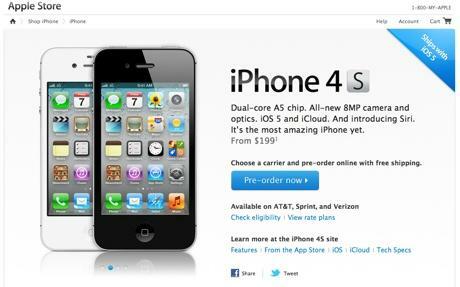 The marketing copy on the front page of apple.com is usually light on details/specs. 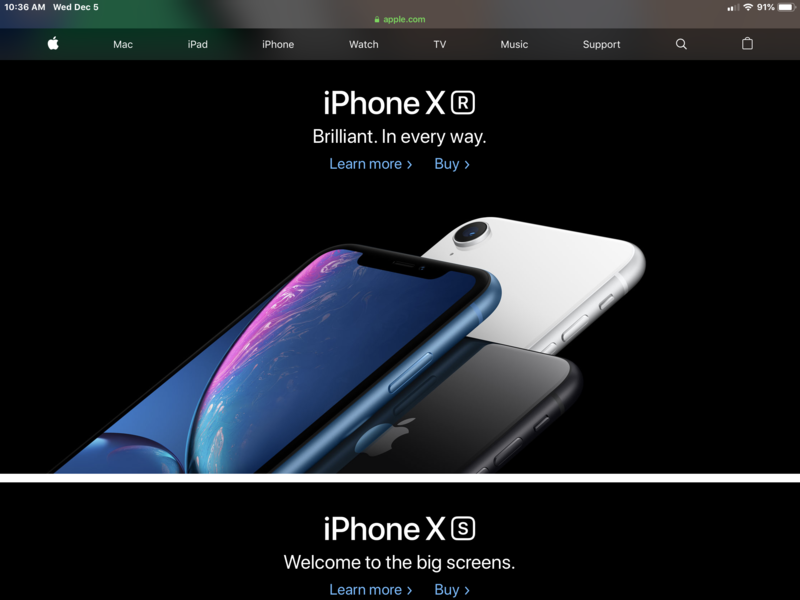 As far as promoting trade-ins, whether Apple should be pushing that (along with a price quote) on the front page of its website isn’t the point. The point is it’s not something theyve done in the past. Perhaps they’re going to be doing more of this in the future but that just tells me the sales aren’t coming as easily as they used to. Hence why Sprint and T-Mobile are giving away the XR for new signups. For what it’s worth, the above screenshot of today’s Apple Canada homepage shows the trade-in marketing approach has not yet spread to this country. Is the USA approach a trial balloon? Looks like a concerted effort to kick the stock while it’s down in order to depress it as much as possible, buy at an artificially created low point, and enjoy the profits after the results for the lucrative holiday season are released. LOL, Rogifan_new. Because Bloomberg is such a reliable source, right? Have they provided any proof yet to back up their breathless China spyware story? Perhaps Bloomberg is feeling threatened by Apple’s curated news service. It is not on the main page but they have been offering Apple Store trade-in credit for a couple years now in Canada. Click on ‘Buy’ on the XR or XS and you see a line along the top about trading in your old phone. They call it ‘Apple GiveBack’. The program runs through Brightstar. Where did I mention Bloomberg?